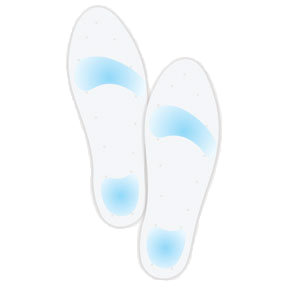 This is an anti-shock silicone full length insole designed to reduce stress caused to the joints and spine. It’s very useful if suffering from heel, knee or back pain as it relieves pressure during walking by providing relief on the front and middle of the foot and heel. The soft blue spots ensure optimum shock absorption, and since it is made from 100% silicone, it holds its shape and stays firm. The ventilation holes provide circulation.